Browse Museums & Culture for more articles like this. Downtown Corpus Christi bursts with colors, sporting murals on almost every block with more to come. Thanks to the efforts of the Downtown Management District, the area known as the Marina Arts District becomes a little brighter every month, and not just through art. Volunteer “Clean Teams” clear the streets and sidewalks block by block, repainting curbs, trashcans, electrical boxes, and sidewalk and crosswalk markers. The area thrives as an artistic community with signature cultural events such as the annual Masterpiece-In-A-Day, monthly ArtWalks and Mural Mixers, and weekly farmers markets at the Art Center of Corpus Christi. 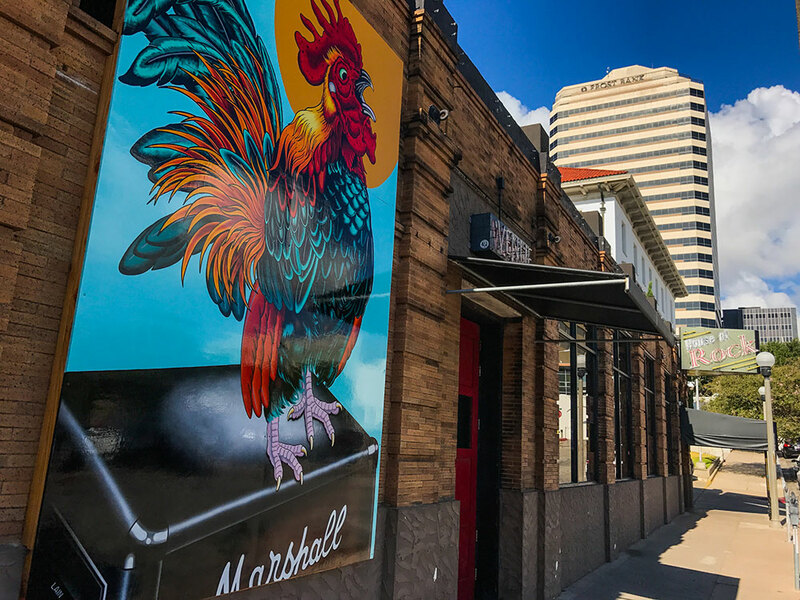 Downtown Corpus Christi is becoming a great place to explore as new murals pop up and more projects are completed. 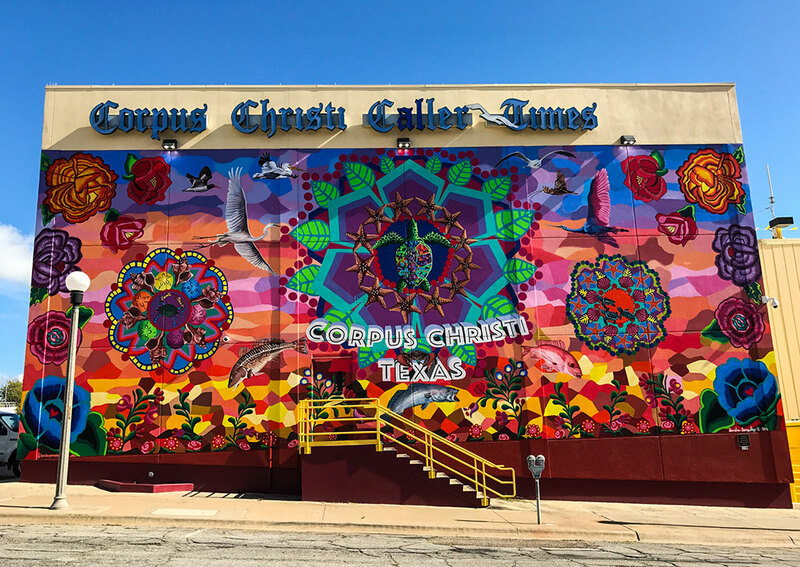 Here’s a list of our favorite murals in Corpus Christi for you to explore, but there are plenty more, many within walking distance of each other. For 80 years, the exterior of the Corpus Christi Caller-Times building was bland and colorless. Erected in 1935, the beige office building was certainly not noteworthy. In late 2015, the Caller-Times decided to change things up a bit and announced a call for entries to bring some color to a blank exterior wall. Artist Sandra Gonzalez was selected to cover a staggering space of 64 feet wide by 34 feet tall. Gonzalez brought a psychedelic dream scene to the building, using every color of the rainbow to illustrate the spirit of Corpus Christi. Find “Endless Sunset” at 820 N. Lower Broadway St. Located at the intersection of North Upper Broadway and Starr Street is a tunnel leading to La Retama Park. At the entrance is the “Dia de los Muertos” mural painted by Ricado Ruiz, Gerald Lopez, Day Wheeler and Jimmy Pena. The mural was made possible by a generous anonymous donor. It was unveiled at a Dia de los Muertos block party thrown annually by K Space Contemporary and Axis Tattoo. 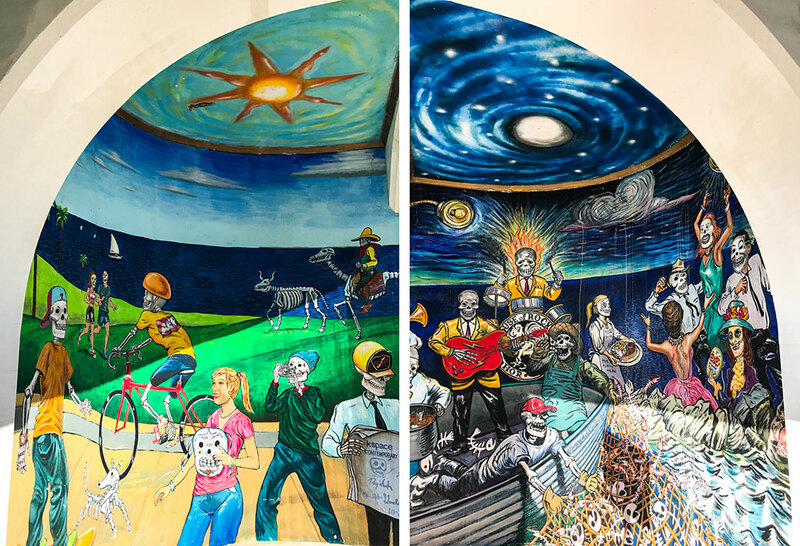 The skeletons pictured in the mural are celebrating the Day of the Dead with nighttime activities on the left and daytime activities on the right. La Retama Park is located at 501 N. Mesquite St.
Muralist Jeremy Flores brought color to the Braswell Office Systems building in July 2017 during his first CC Street WAVE mural art gathering, an event intended to inspire young artists in the city. His mural, “A Breath of Fresh Air,” depicts a baby turtle making its way to the Gulf. The entire mural is awash in blue with a wonderfully detailed turtle gliding through the water. 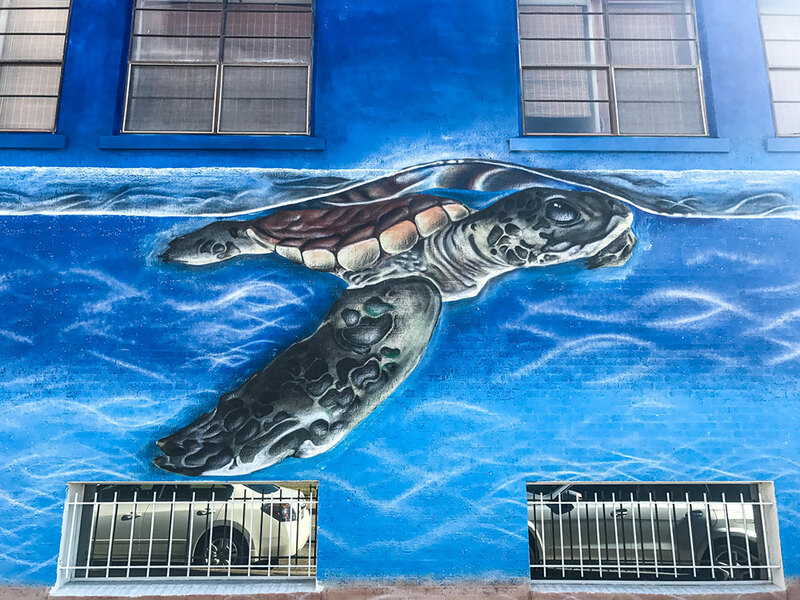 This mural honors a beloved and popular occurrence that makes summers extra special at Padre Island National Seashore: when tiny, freshly hatched Kemp’s ridley sea turtles are released into the surf. “A Breath of Fresh Air” is located at 301 N. Mesquite St. Unveiled in October 2015, “Lotería! The Mural” was a collaboration of 50 artists who sought to brighten up the backside of the K Space Contemporary building. A game of chance that originated out of Mexico in the late 1700s, Lotería is similar to bingo. 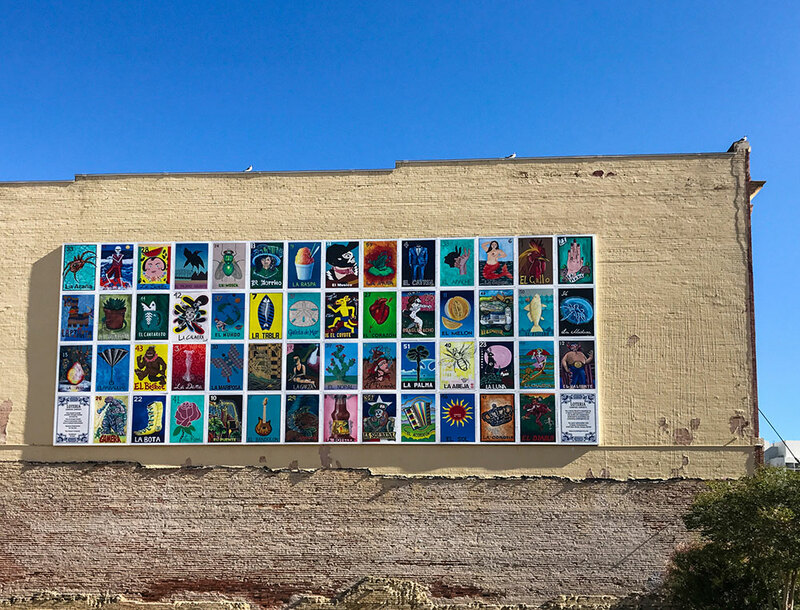 The mural is 52 feet wide and 24 feet tall and depicts each card in a Lotería deck. The cards shown in the mural were chosen from 130 original designs submitted by 114 South Texas artists. The mural is one of the largest public works of art in the city and is iconic to Corpus Christi. View “Lotería! The Mural” at 619 N. Chaparral St. 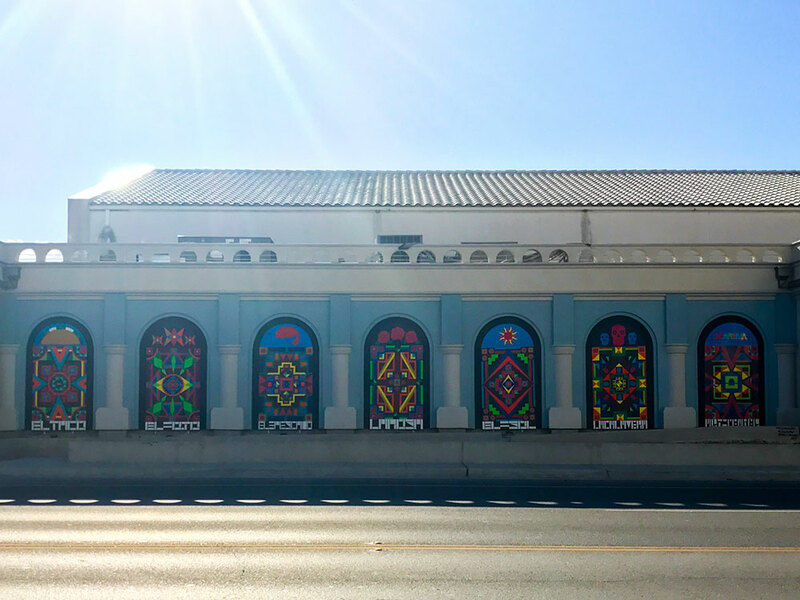 The Art Center of Corpus Christi puts out an annual call for artists to submit new and original mural designs to fill seven arched spaces that face Shoreline Boulevard. The current work, “Chicano Pop,” was created by Mayra Zamora last year but is soon to change. Each September during the annual Arts Alive! Festival by the Art Center, the seven arched spaces are designed right in front festivalgoers. Guests speak and interact with the artists as they create their stunning pieces. The new work is done by Ben Munoz, and involves six handcarved wood blocks containing images evocative of Corpus Christi. The Art Center is aiming to install the wood blocks in January 2018. The new exhibit brings a new aspect to the space. Admirers will be encouraged to make rubbings of the carvings. 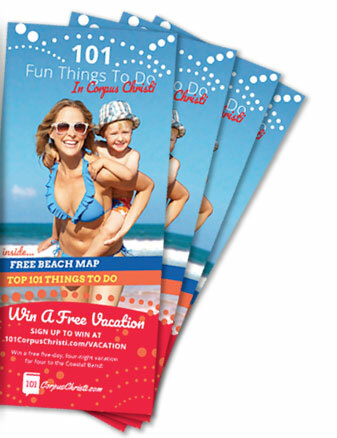 The Art Center of Corpus Christi is located at 100 N. Shoreline Blvd.